As is customary, the Cowboys' media representative strolled through the team's locker room at AT&T Stadium Saturday night alerting us dorks with notepads, microphones and cameras to the details of players' impending interviews. "Tony Romo," she said - as we all anticipated the usual will be in the interview room in five minutes - "will be in the coaches' office ... on speakerphone." Okay ... Wait, what the what?! After an impressive pre-season finale in which he threw for two touchdowns in the win over the Bengals, seems the quarterback left the stadium without speaking to the media. And now, to make it right, he was calling in. From his car. No biggie. No crime. Just weird. Never in four decades covering covering this team have I enjoyed listening to a player hold his post-game presser via phone. 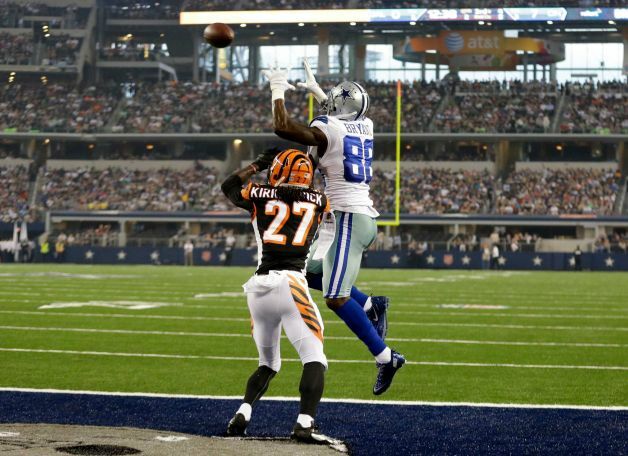 While that was surprising, the Cowboys' cuts from 90-75 this week won't be. Receivers Anthony Amos. Jared Green and Eric Rogers. Tight end Colin Cochart. Linebacker Deon Lacey. Kicker Brett Maher. Defensive linemen Jabari Fletcher, Jerome Long and Jason Vega. And, despite his interception to seal Saturday night's win, defensive back Xavier Brewer, along with Jakar Hamilton. For my Top 10 Whitty Observations on the game, let's jump over to NBC 5's Blue Star Blog. I'm a little confused - how was this the pre-season finale? Don't we play the Texans on Thursday night? And PS - I enjoy reading your blog but I was sad that you teased your Top 10 then just posted a link to another site. I wanted to read it here. Wow, what a tease. I won't be going to another network sponsored site, CBS ruined me on that whole fiasco and I stopped reading your blog during the RaGE years. The Romo thing is a head scratcher but I've always wondered, when those guys stay for questions and then leave, are they stuck in the same traffic like you and I? 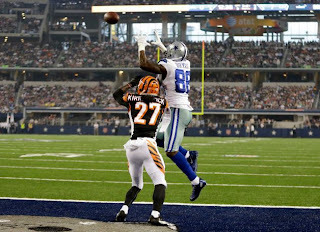 I've never had one of my friends or anyone on my twitter tweet "omfg, I'm right behind Dez! He's stuck in traffic like we are! YOLO!" How does that not happen more? It won't kill you to click the link. The man's gotta eat, right? My bigger issue is with Richie not wearing a tie on television. I get it. In your mind you're a rebellious daredevil. You really stick it to the man by not wearing a tie...yet still buttoning your collar. Ugh. Just wear the damned tie. Pretty sneaky and smart to link Blue Star Blog. Good job.